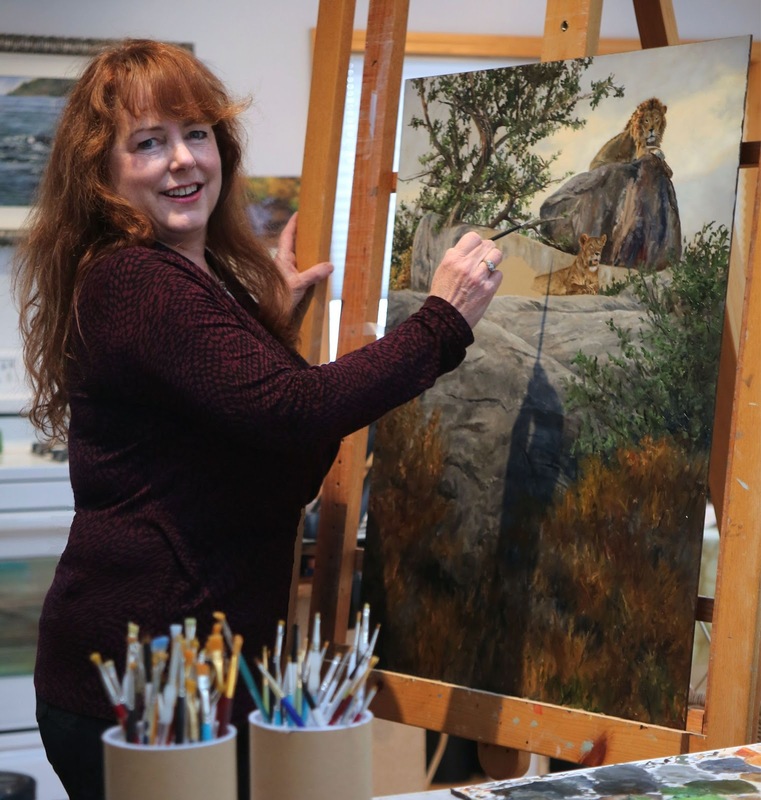 Some artists use a palette knife to paint. I use one to mix paint - and scrap it off. The lower dark left section I painted three? four? times. If you add up all the changes it was more than that. Just as I thought "that is it", I'd take a second look. No. Time to move some paint around, add lighter and darker areas. After taking a break or seeing it the next morning, I'd decide to scrap off that section and start over. There are just a few more adjustments to make so I think I can put down the palette knife and move on. For the foreground snow I am increasing the hue. There are passages of cerulean blue along with the purple tones. Below, the last of the "white" is painted. With the temperature 22 degrees here, it is not hard to imagine snow. I removed the snow "blob" over the antler on the right. Originally I thought it would nicely highlight the antler but it was merely distracting. With the vertical board removed which supports my hand rest, the whole painting is visible. The right lower side was especially tricky. I wanted some detail but not so much that your eyes were drawn to that spot. It took some playing around so the paint would suggest detail without screaming look at me. If you click on the image to see it larger, you can see a couple of splashes of "royal blue" (ultramarine blue, cerulean blue, titanium white) thrown in to give depth and tie the foreground to the distant background trees. I'm up to using five brushes now. Each is designated for a range of colors. 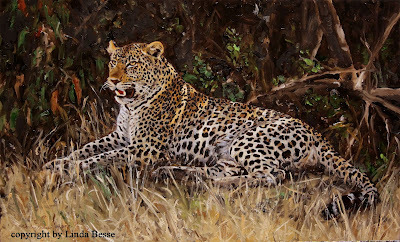 One of the advantages of oil paint is that it works so well for blending the edges which makes the painting feel natural and not static nor cut-out. Thanks for following along. As you can see, this piece is slow going. Sometimes telling a simple story takes a very complicated setting. One of the things I love about living in the country is the way a freshly fallen heavy snowfall looks on our trees. When the sun comes out, it is magical. Unfortunately, painting a scene like that is very time consuming. Each section takes careful thought. Rather then complete all the dark tones first, I work on the dark, light, and medium colors at the same time. For the furthest background trees, I mixed three dark blues. 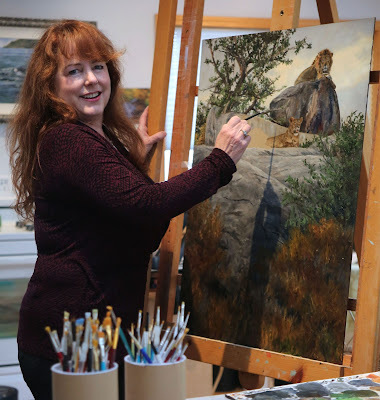 An article needed a photo of me painting so why not the piece I am working on. 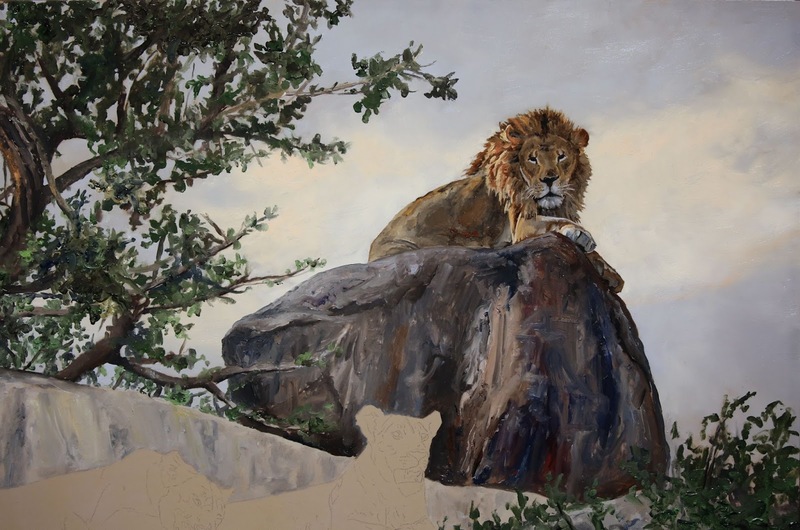 You can see the first lioness is done and before I move on to the second lioness, I wanted to touch up a few areas on the upper boulder. 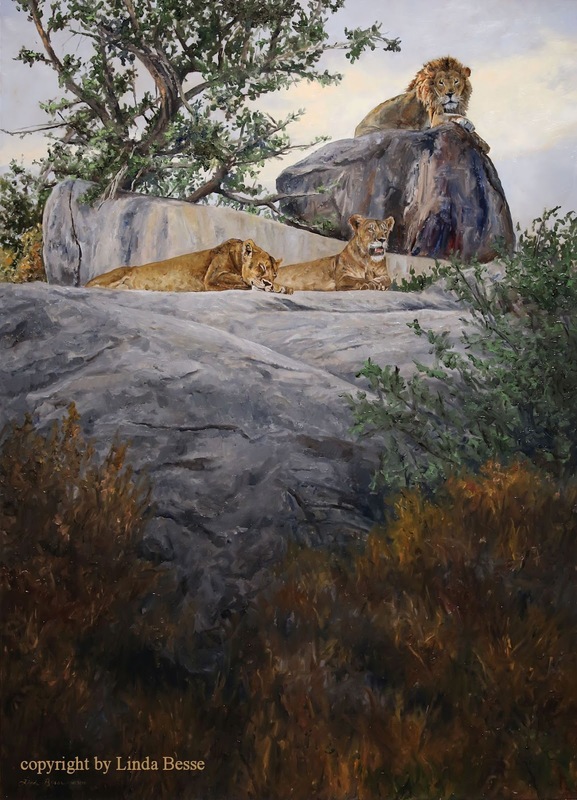 I wanted to paint the male lion first to key in the warm tones for the cats. Up to this point, the painting had an overall coolness to it. Cool greens for the fig tree and lots of gray in the rocks. Even the upper boulder's reds are cool. I used Indian Red and a little Burnt Sienna for the reddest sections. 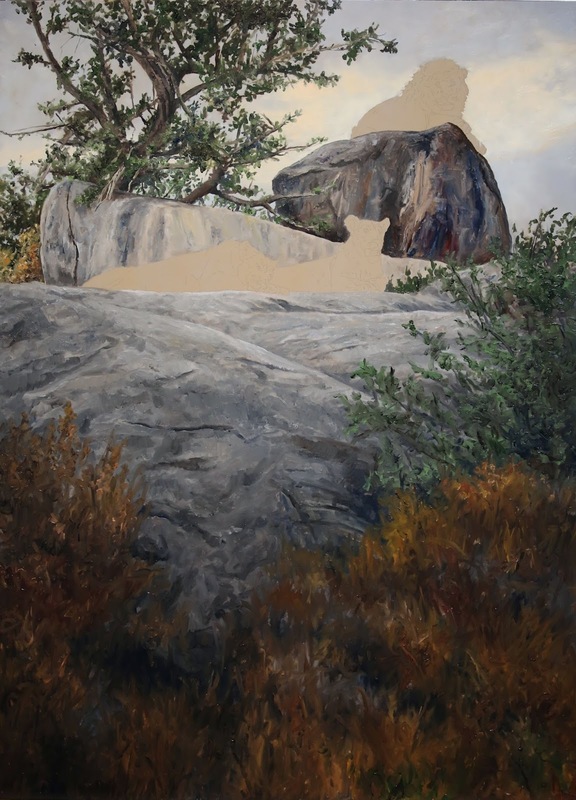 The rocks may be the foundation of the painting but the warm tones will tell the story. The darkest areas in the lower grasses are designed to lead one to the base of the rock and direct one's eyes to the focal point. With a Master of Science Degree in Geology, it is not hard to imagine that I like rocks. Big ones, small ones, gray or colored, rocks are neat. Even though I have seen a lot of them, I was not prepared for the dramatic kopjes of the Serengeti in Kenya. The huge islands of Precambrian granite create havens for fig trees, thirsty plants, and shade-loving animals on the flat African plain. Often boulders, weathered and cracked by sun and wind, are perched on the highest and most exposed part of the rock group. With the full painting in view, you can get a better idea of the composition. 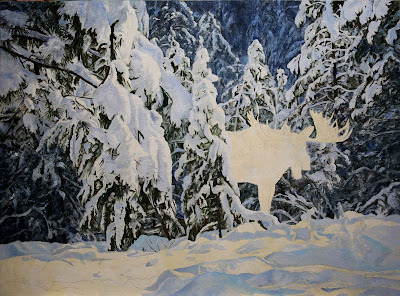 When I was first envisioning this painting, it was a simple silhouette. My handful of references were going to serve me well. The further I delved into the concept, the more I wanted to add. Now came the questions. Was I being a good editor? Did the additional elements move the story along or detract from it? While it would have been much easier to stay with my original idea, I had to admit the more complicated story made for a better painting. This piece is using so many of my reference photos that I needed to create a new folder to organize them. The images span multiple other folders and trips. The painting is 33" X 24" so all you are seeing below is the very top part of this vertical work. For trees, and especially this fig tree, I like to "build" the framework of branches before I start on the leaves. I believe there is inherent beauty in the natural world and kopjes with fig trees are a great example. The free-flowing structure of these trees is a perfect contrast to these striking rock formations. 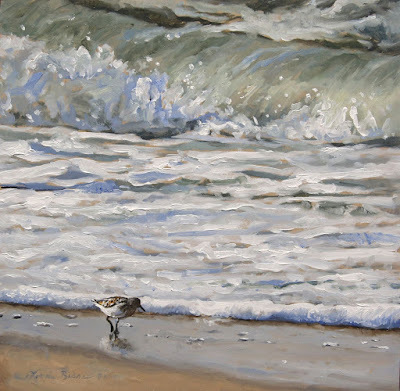 This year I have completed a number of paintings for the Louisa Gould Gallery on Martha's Vineyard and sales have been good. There are so many iconic Vineyard scenes. In these two pieces I wanted to take a different look at two places. The first is Menemsha - a quaint fishing village up-island. 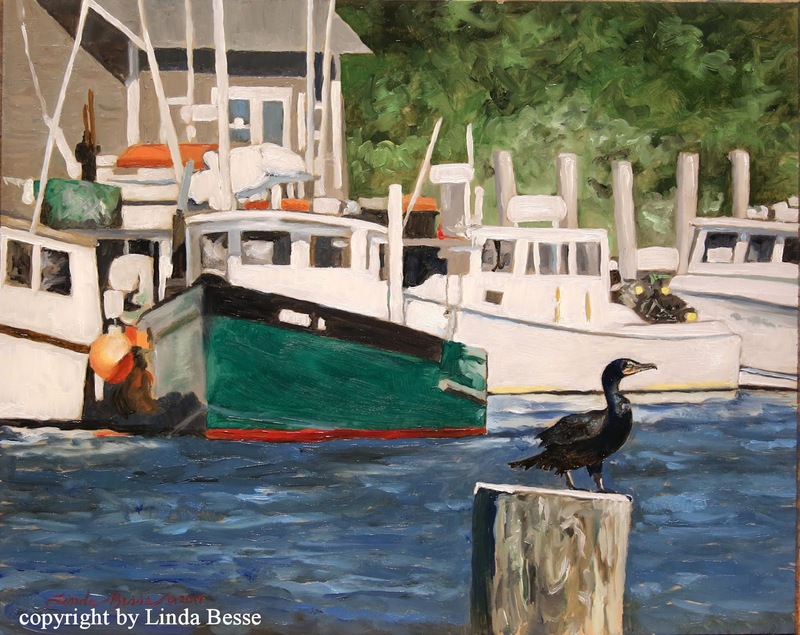 Rather than focusing on the boats and buildings, I thought putting a cormorant in the foreground would further illustrate the good location for fishing. These birds are often seen on the pilings waiting for the incoming tide teaming with fish. The second painting showcases Martha's Vineyard's sailing history. 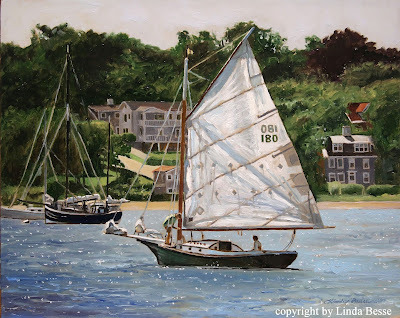 Vineyard Haven harbor has provided sailing vessels a safe respite for centuries. The background of this painting is Owen Park which is just outside the harbor breakwater. We were sailing when I got the idea for this piece so it seemed appropriate to paint it from the water's side. "Silent Skies" is an international collaborative super-mural mosaic featuring all 678 endangered species of birds of the world. The installation forms the artistic centerpiece of the 27th International Ornithological Congress in Vancouver in 2018. 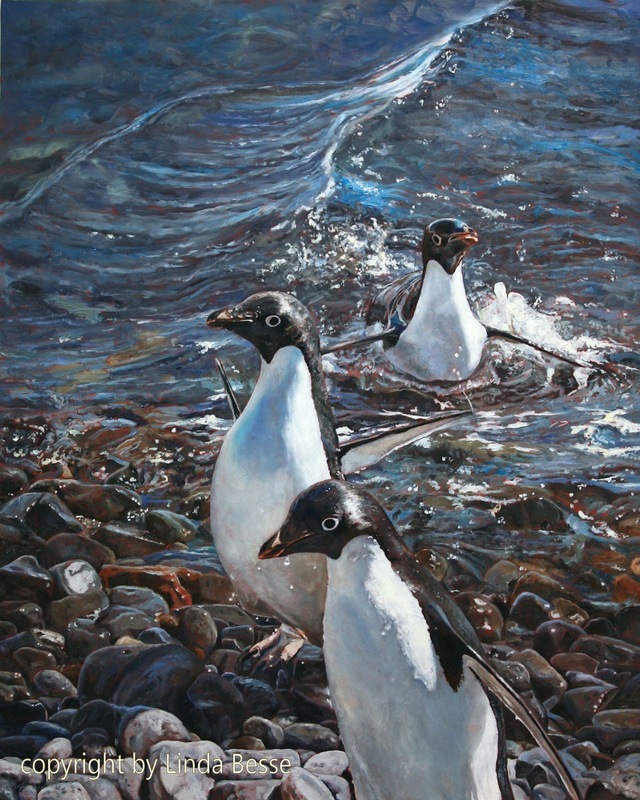 The original mural will go on international tour to select cultural and scientific venues and a limited number of canvas giclee editions of each will be available for sale. Proceeds will support bird conservation and environmental education. Each original piece is 8" X 8". 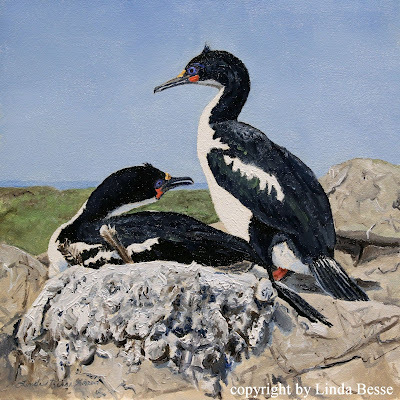 I chose the Chatham Island Shag, endemic to the Chatham Islands of New Zealand. The last horse was more a challenge than I expected. The color seemed pretty straightforward - a golden tan. 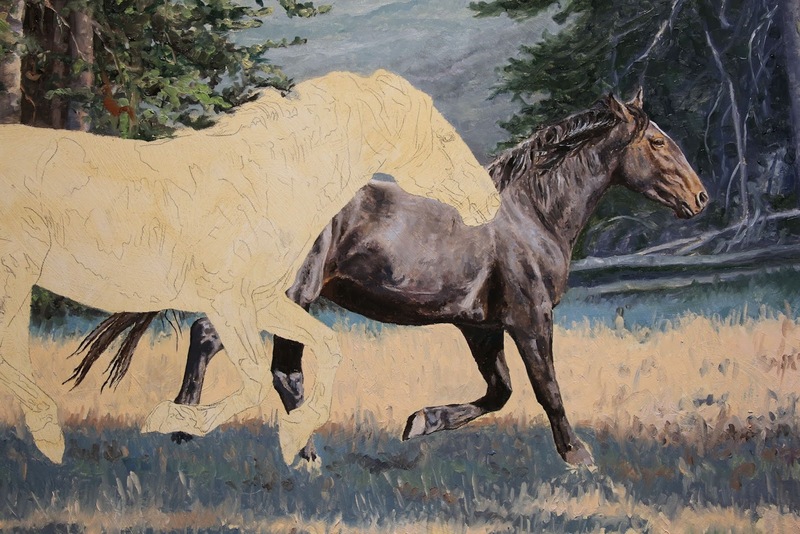 Once I stepped back from what I thought was the finished horse, it looked really dull. The coat did not shine like the other two. Taking a note from the last painting, Track Team, when I pushed the color, I started mixing what felt like outrageous combinations. When blended with the still wet paint, it worked. 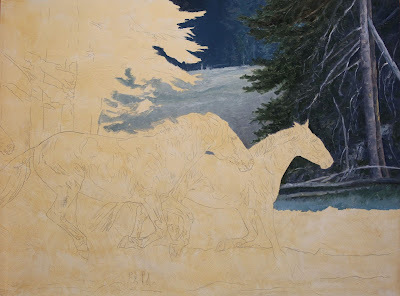 With the last horse painted, it was time to revisit the background trees on the left side. Though there were some nice passages of light, I felt they needed more depth. Dark greens, browns, and navys were added to enhance the trees. The last step are the grasses. 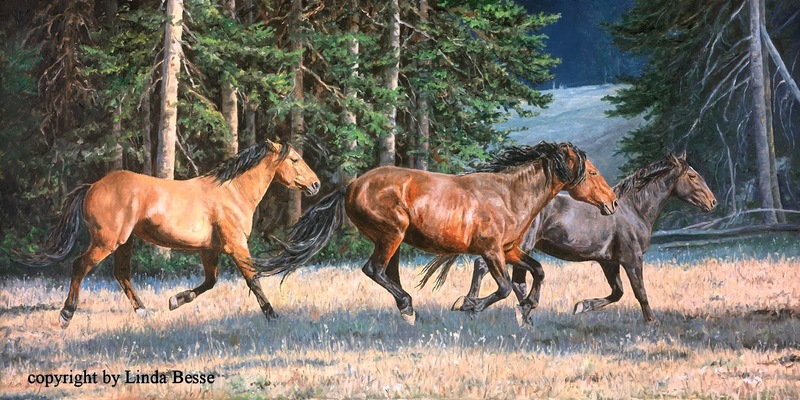 I could add streams of dust but these Pryor Mountain horses are in such good shape because of the abundance of grasses even in the dry months. Much of my time with them was spent watching them eat, hearing them crunch on the varied low growth vegetation. 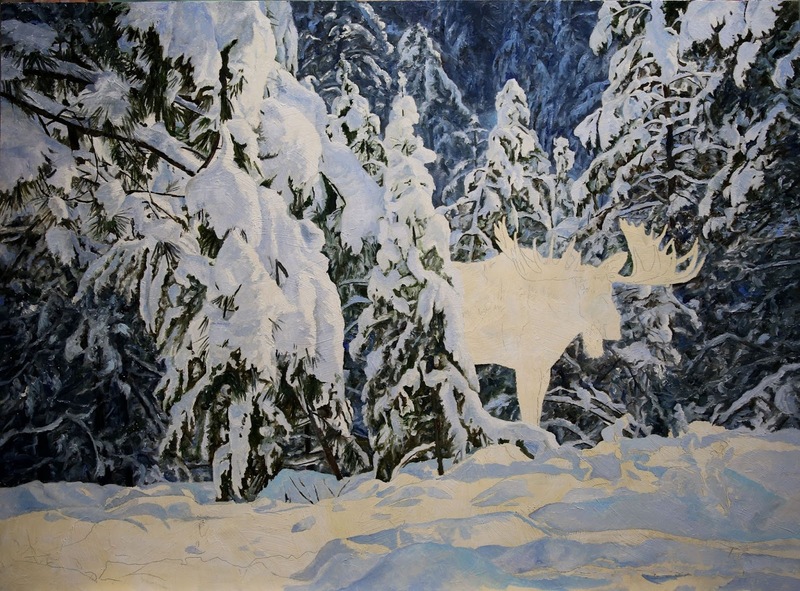 Below is the finished piece scanned before it is varnished. Once the spray varnish is applied the darkest darks will be more pronounced. This stunning horse is definitely one of my favorites. One thing I particularly appreciated about seeing these wild Pryor Mountain horses was the variation in the color of their coats. The three in the painting are quite different from one another and the painting was inspired after seeing them together. For the artists reading this, don't know if this happens to you but it does to me. Hitting the ugly stage of a painting. All of a sudden a good plan becomes a mess. The brilliant execution flounders. There is no hope of recovery. Well, maybe there is. I've been doing this long enough to know that if I keep working at it I can move through it. But there is always that lingering doubt. On this piece it happened on the left to middle background trees. I could not see the forest for the trees or maybe it was the other way around. Rather than stop and take a photo (and you would have been able to see the mess) I kept working it. 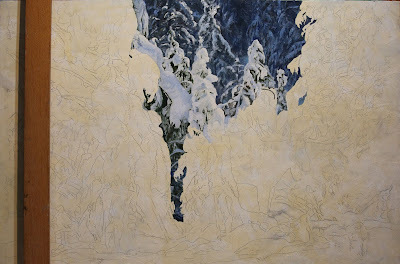 No food, no distractions, no stopping, just trying to quiet my intellectual hesitations and let the painting happen. It took a while but I believe I came out the other side. The background now speaks more to my experience with the horses than I originally envisioned. Heading home from seeing the eclipse in Wyoming (totality was awesome) I had a chance to spend time with the Pryor Mountain Wild Horses. It has been decades since I have seen wild horses. Ever since a chance encounter in Nevada, I have wanted to see them again. A rugged almost two hour trip by ATV to one of the high points in the horses' 38,000 acre range was worth every bump. In total I saw about 50 different horses! They were eating, running, drinking, splashing in water, mock fighting, mating, resting in the shade, and nuzzling each other. I could not have asked for more. Though I took over 2500 reference photos, I had plenty of time to sit and watch them especially at the spring-fed pond. I must admit I was expecting more mangy looking animals. Hardly. These horses looked like they had just come from a groomer - gleaming coats, toned muscles, and full of energy. I saw a colt, a gorgeous 21-year old stallion and every age in between. The horses' range is in and near the Bighorn Canyon National Recreational Area. (Note: the recreational area is in Wyoming and Montana and quite a scenic drive on route 37.) They are descended from Spanish Colonial horses which arrived in the 1500's and herds have roamed the Pryor Mountains for more than 200 years. What to paint first? I knew I wanted to start with a large painting. The experience was too overwhelming for a miniature as my first piece. I worked up numerous compositions and then one seemed to stand out. Once I changed the setting to a more interesting section we hiked I had my idea. Pronghorn are considered the second fastest land animal after the cheetah. They can reach speeds up to 55 mph and maintain it for 1/2 mile. This speed demon can run 35 mph for 4 miles. Either speed would clearly outdistance any of North America's current predators. One theory suggests they evolved their fleetness to outrun the extinct North American cheetah and prehistoric lions and jaguars. Regardless of the origin of their speed, a slate of pronghorn would make for an impressive track team. 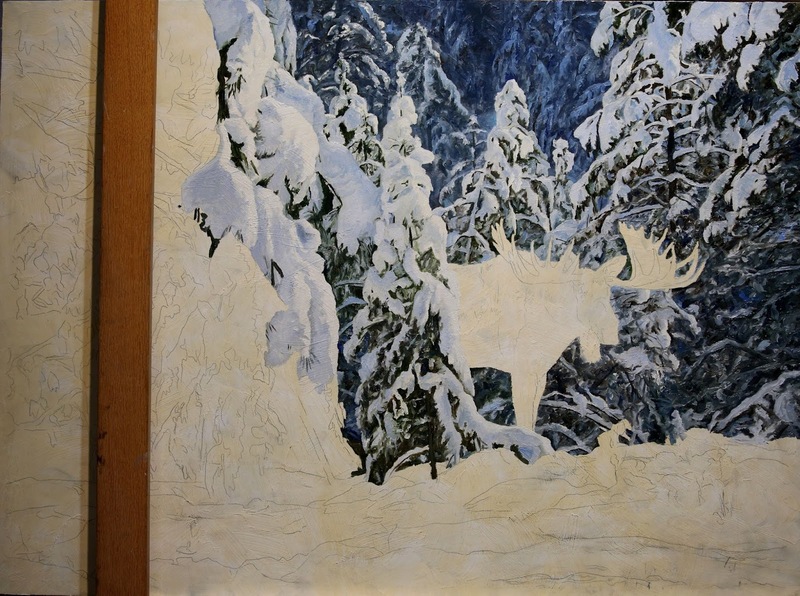 Adding the whites (titanium white and a little cadmium yellow deep for warmth) is what I have been waiting for. All of a sudden the animals had shape and substance. Though I have pushed the color on this piece, it still feels like a natural representation to me. All that is left is the foreground grasses and final touches. On my drive through Wyoming this past February and March, I was fortunate to see numerous pronghorn herds. 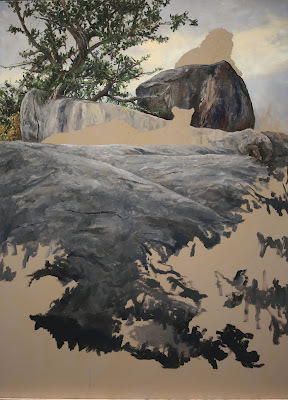 For this painting I spent a lot of time trying to figure out which body positions would give a sense of movement to the piece. For the antelopes' shadowed areas I am using the purples of the sky to create color harmony in the painting. On my drives through Wyoming, Montana, Colorado, and Saskatchewan I am often rubber-necking looking for pronghorn. Driving on I-25 from Sheridan, WY to Denver, CO almost guarantees at least one good sighting. 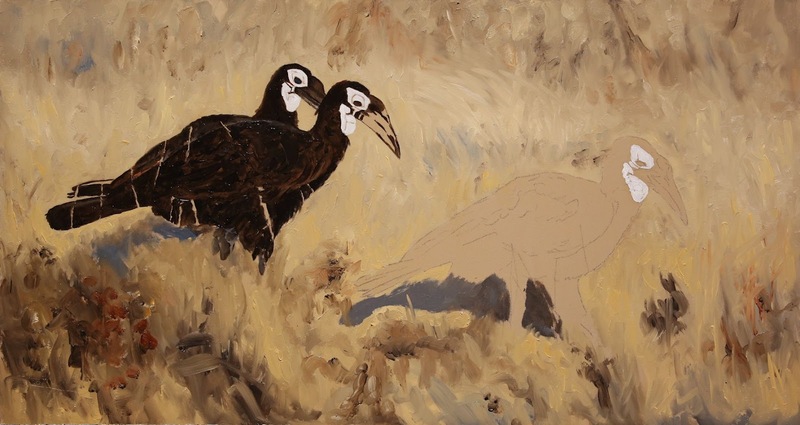 At this stage in the painting I am playing with the deepest reds and deep blue-browns for my blacks to get a feeling how they will work with the background. For the most part I would describe my color palette as natural. 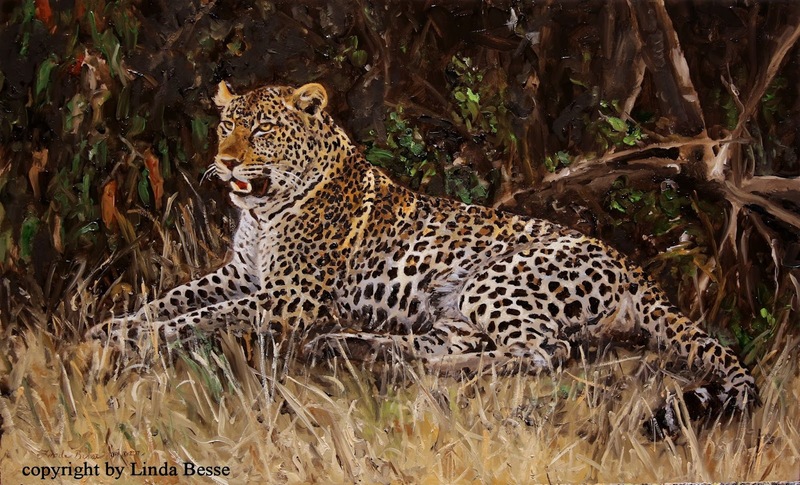 The colors of nature work well for my wildlife pieces. But, there is something to be said for a bit of exaggeration in color, a dynamism which can enhance the painting. 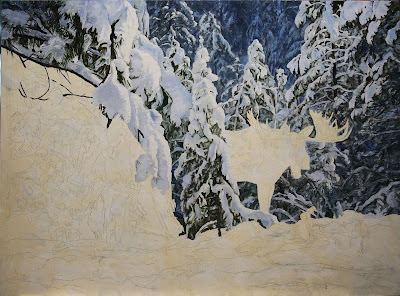 So, in this painting I am going to push the color beyond my normal palette and see what happens. Rather than a typical blue sky I have made it more purple which works well with the complementary yellow background grasses. As a Signature Member of Oil Painters of America I am eligible to be selected as a juror for their shows. 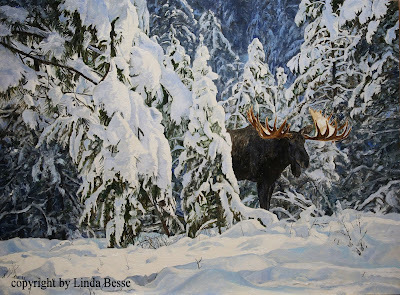 When I accepted to be one of the five jurors for the Western Regional Show, I did not know how much work, how fulfilling, and how inspiring the process would be. The jury consisted of 3 Signature members and 2 Master Signature members. I did not know who the other jurors were and was charged with telling no one that I was a juror. Before accepting, I asked if I would be able to submit art to be considered and how that would be fair. OPA has a very equitable system. While I could vote on my own work, my vote would be replaced with the average of the votes from the other four jurors. The jury process is a two step system. 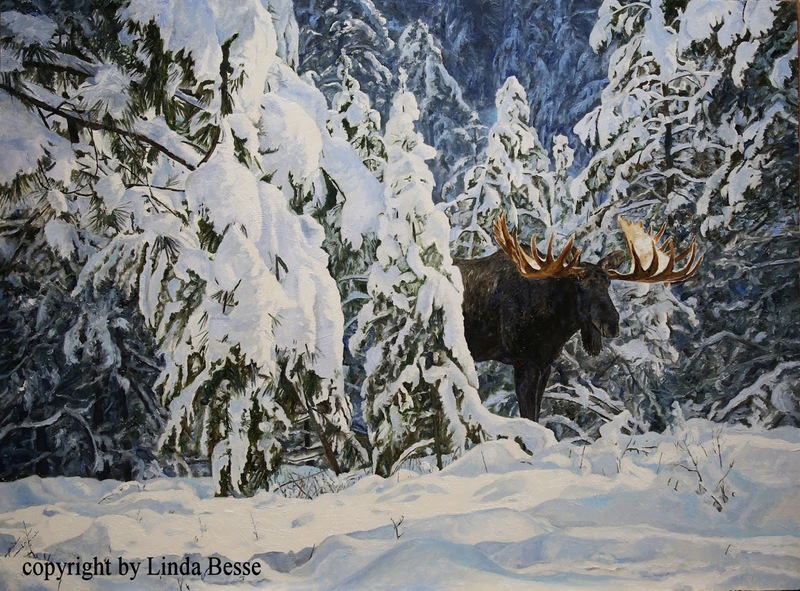 For the first step, all submissions are reviewed and given a number to either pass through for additional consideration or to recommend that the piece not be included in the show. I did not know the artists' names, but could see the image, size, and description. 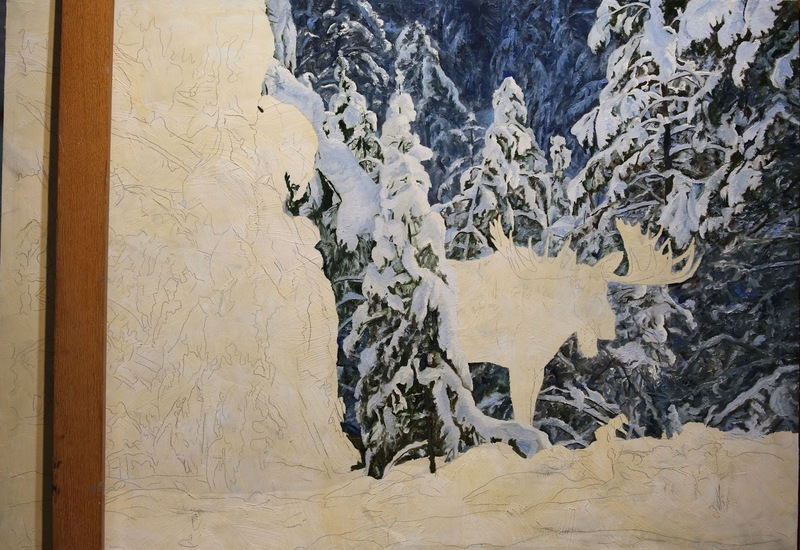 Each piece could be seen by the jurors online at Juried Art Services as a large thumbnail and then blown-up to almost full computer screen. Before we started, it was suggested the jurors look at each piece before going through them to vote. A detailed voting criteria was given to each juror so we would be looking for the same things. (A note was added to the criteria that we were not to consider subject matter.) You can imagine carefully reviewing almost 900 pieces at their largest on the screen while constantly referring to the criteria would take some time. As I worked through all the pieces carefully looking at the full screen version, I voted. For 7's, I had 10, which was within the top 3%. These pieces were truly outstanding and I thought any museum would be happy to include them in their collections. However, when I finished my voting pass, I had over 260 5's and 6's. Back to the drawing (painting) board. Time to carefully review each 6, then each 5 and so on. After several more passes, I had a reasonable number of pieces with a rating of 5-7 with the remainder 1-4 . The above was the mechanics of the process but being a juror was so much more than that. Looking at a variety of approaches to subject matter and the choices artists made from color to its application was inspiring. I saw pieces that made me gasp at their beauty. Bold choices in lost edges, dramatic and subtle decisions in color, and deft uses of the medium which I exclusively use. Judging with no regard to the subject matter freed me from more subjective voting and opened my mind to a fuller range of possibilities for oil painting. I was completely impressed with OPA and how organized and very available they were to answer questions. What I was unprepared for was how rewarding the jury process would be. Like the other OPA members who submitted pieces, I anxiously awaited the notification date and was happy to see that my piece Shore Leave was accepted for the show. 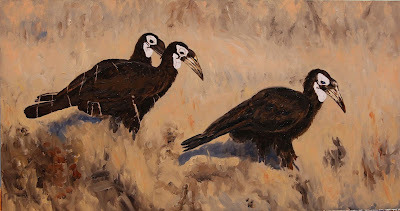 Ground hornbills are impressive birds. The largest of the hornbills, males can weigh up to 14 pounds and they can even kill small mammals such as hares to augment their diet of reptiles, frogs, and snails. To achieve the brilliant red around their face I first painted it white (titanium white with a smidgen of cadmium yellow deep.) 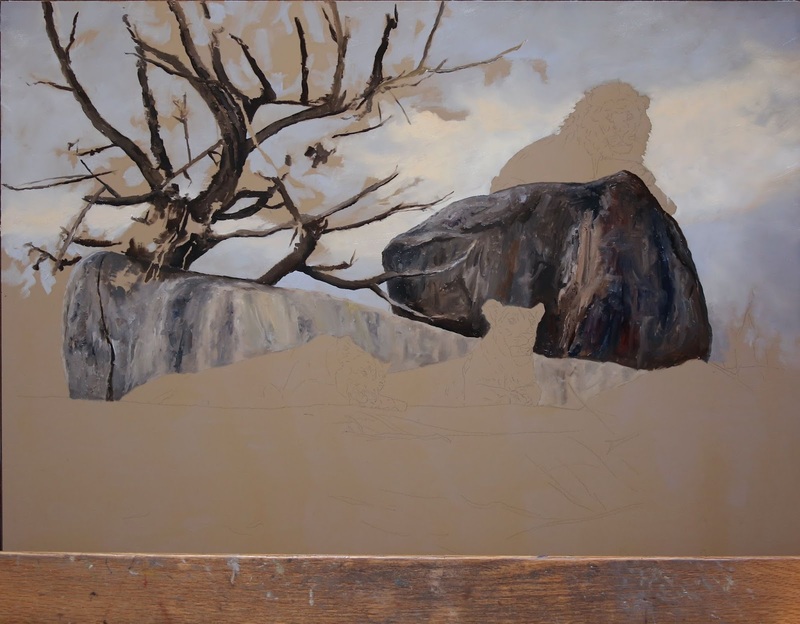 When dry, using Liquin as the medium I glazed over it with a various combinations of cadmium red and cadmium orange. 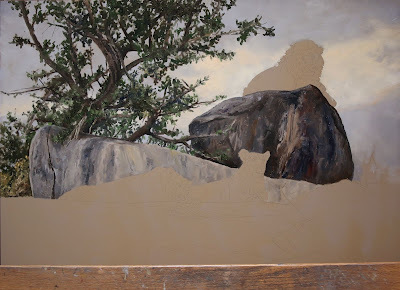 Burnt Sienna and Burnt umber were used for some of the shadow areas. The yellowish background (yellow ochre, naples yellow, titanium white, and a little paynes gray and van dyke brown) wasn't doing it for me. I felt it needed to be more peach so the future yellow foreground grasses would stand out. Using my left over background mixture, I added cadmium red, yellow ochre, some burnt sienna, and titanium white. I've also darkened and added more ultramarine blue to the birds' shadows. 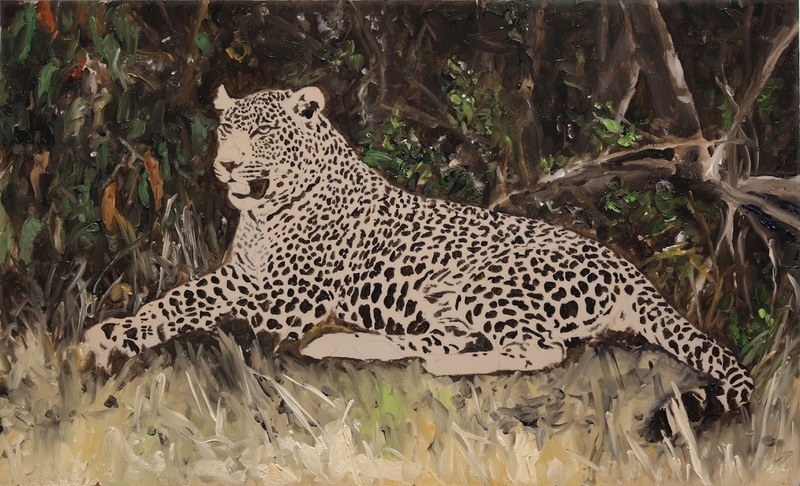 Before I started working on the previous leopard piece, I painted the white passages on each bird's head. These sections will be glazed and need to be dry for that process. Once the painting is varnished, you will be able to see more detail in the background. I have found that many brown combinations dry dull and liven back to their original intensity once varnished. My go-to spray varnish these days is Krylon Gallery Series UV Archival Varnish 1376 Semi-gloss. It adds just the right sheen, not super glossy nor matte. Just getting started - lots of cat to go. It would be easiest to do a simple animal portrait and call it good. 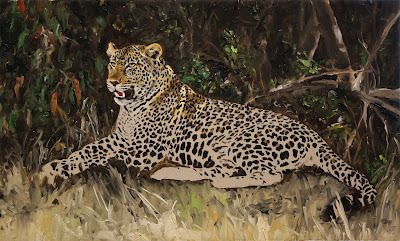 Guess what I am going to do .... yes, let's paint a full reclining leopard in the shadow of African vegetation. 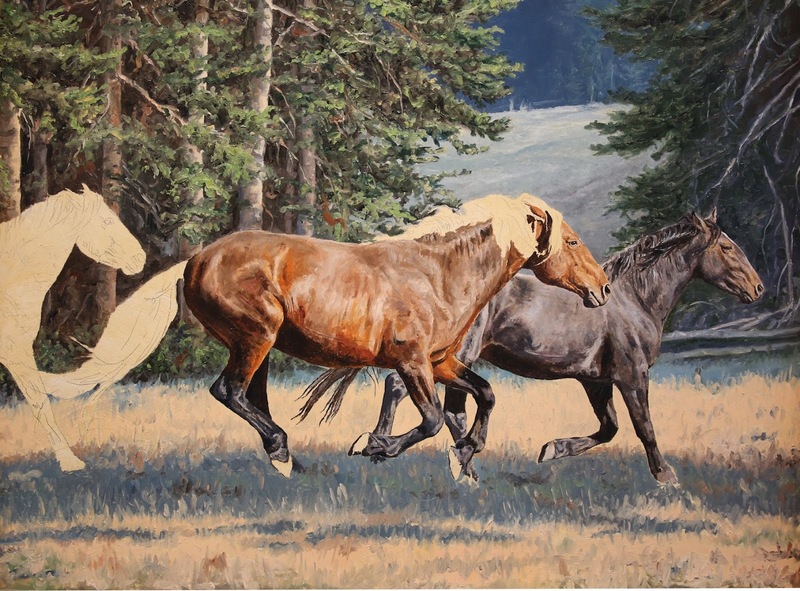 Below I have the background roughed in and some base color for the foreground grass. 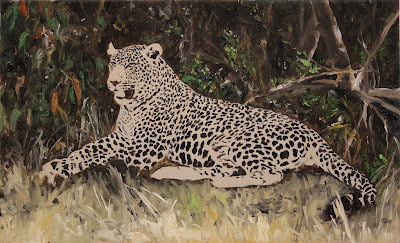 I like to paint the spots first to give me a feeling of the cat's muscle structure. 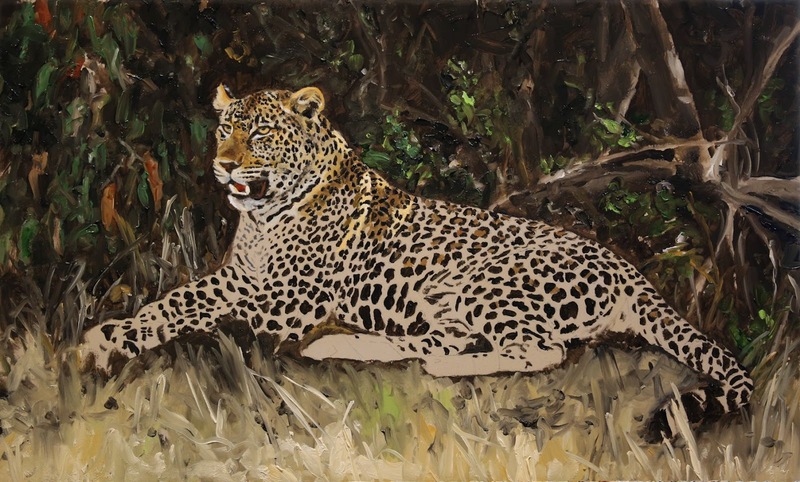 Once I paint the other colors of the fur, I will repaint the spots and blend the spots' edges into the rest of the fur. The painting is now dry and I've scanned it. Thought you might like to see the difference between the photo of the piece and the scan. Detailed grass has been added since the last post. I've also dry brushed in a bit more gray/blue throughout the grass. Another important change is a softening of the background trees. In an earlier post I mentioned that they may be too dark. To push them more into the background so they do not compete with the dark browns in the dogs, I glazed over them using the sky color and liquin. 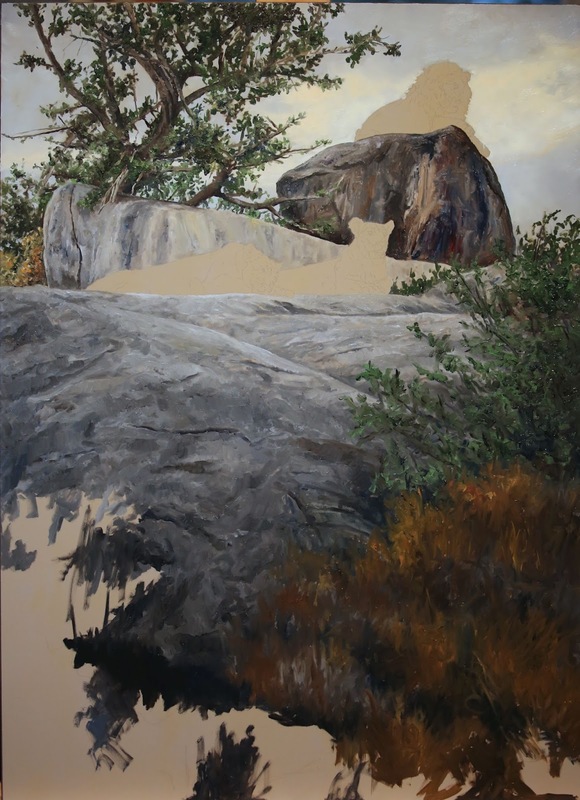 Liquin gave me the flexibility to keep the structure of the trees and soften them to different degrees depending on how much paint was mixed with the medium. Thanks for following. An additional note on this commission. Each of these in progress photos was sent to my client. It was a nice way to keep him involved in the creation. To one set of in progress photos he replied, "Coolest project ever!" With both dogs completed, now it is time to turn my attention to the painting as a whole. Since the last post I have lightened the breast of the closest bird and enhanced the oranges on his face. Before I begin on the detail grass, I've added some more texture as a base around the dogs. My primary color is yellow ochre darkened with some paynes grey and raw umber. I've also taken a gray-blue mixture (paynes grey, titanium white, cerulean blue, and ultramarine blue) and dry brushed it into various passages that needed a lift from all the browns. 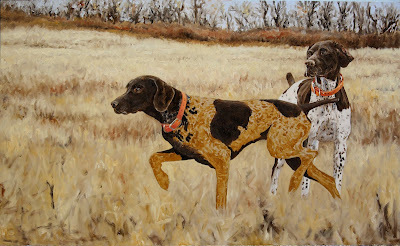 The position of the dog in the foreground is classic example of the German Shorthaired Pointer's bird hunting strength. The ability to find the birds and then hold is what these dogs are prized for - in addition to their affectionate companionship. Some of my best photos of this dog were taken with this dog pointing the other way. My vision for the composition had her pointing to the left. So I reversed some of the images and then used my reference photos of her left side to change her right side coat pattern into her left. The main saddle brown spot is smaller on her right side and does not have a notch, the brown spot on her rump is a different shape, and there is more brown on her neck on her left side. If this was not a commission, these details would not matter, but a loving owner will know the difference. German Shorthair coats come in a variety of patterns. Fortunately for me, these two dogs' coats are distinctive and together make a perfect pairing. Artistically I wouldn't change a thing. My client had the right idea to put both of them in the same painting. 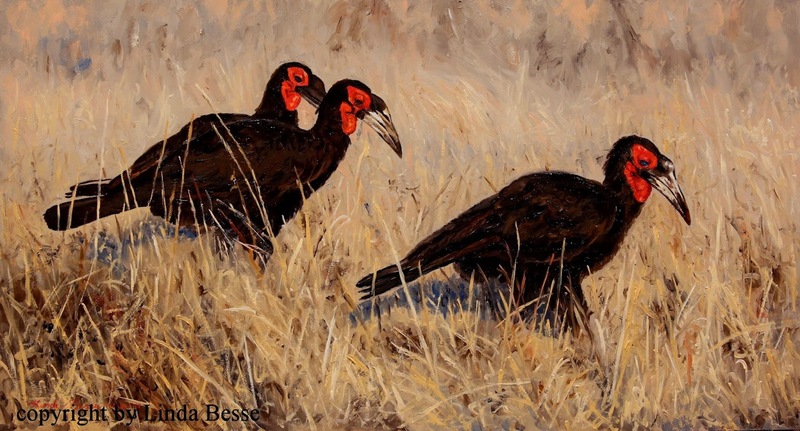 As the name implies, these upland game birds were imported to the United States from Hungary. In the late 19th century this bird, also called the gray partridge, was released in Washington and California. It now is found in many states and also in Canada. 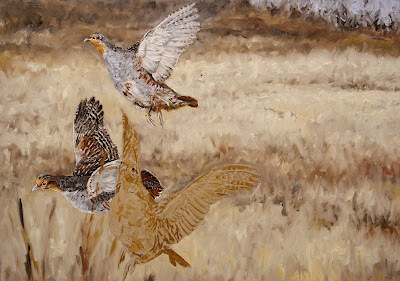 The patterns on the Hungarian partridge are stunning. To realistically depict them I reached for my small brushes and the magnifying glass! In the painting each bird is between 3 and 4 inches across. For the trees and bushes I used the background of my photo shoot for inspiration. The bushes had a reddish tint which I magnified. Once the dogs are painted I'll know if some of the tree trunks need to be lightened for balance. In the above photo you can see I've added more texture to grassy area. This will form the framework for my grass. Here I have roughed in the grass. The upper area is cool with naples yellow, titanium white and blues. 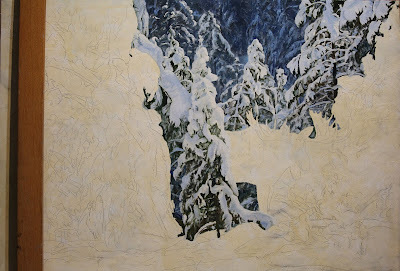 As I moved down the painting more yellow ochre was incorporated. Further grass details will be added after the dogs are painted. At a show this February one of the attendees saw my painting Chukar Hunt and found that I do custom sporting dog commissions (in addition to other commissions.) It so happens that he has two German Shorthairs. In early March after the Natureworks show in Tulsa Oklahoma, I had the chance to swing by his house on my drive home and take my own reference photos in anticipation of a painting. Five hundred photos later, and time watching the dogs' movements in the field, I had what I needed. Once I finished other painting commitments into early June, I created a mock-up idea and 3 other examples to present to the client to see if I was on the right track. I was, and after some minor modifications, it was time to start. When I return from a reference gathering trip, my thoughts are often fixated on the wildlife I saw. Before I start on an upcoming commission, this piece begged to be painted.